There are good resources for helping us pick the right native plant for the right place on the nursery websites listed in my earlier post. There are also non-nursery on-line programs available to help with plant selection. 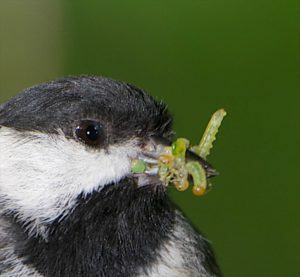 Audubon has a program called Native Plants Database. It’s easy to use. Just put in your e-mail address and zip code and a number of tabs pop up showing lists of native plants, what they host, local resources for native plants and next steps. It also references butterflies, caterpillars and birds use. Tiger Swallowtail on Cherry Tree. Native Prunus support 456 species of caterpillars. Photo by Doug Tallamy. The Lady Bird Johnson Wildflower Center‘s Native Plants program has been around for a long time. This program asks for your state and a variety of site characteristics (habitat type, light, soil moisture, etc) and then brings up a list of suitable plants. It also includes a comprehensive database of native plants which includes a variety of information from description of blooms and leaves and growing conditions to benefits and distribution in the USA and Canada. 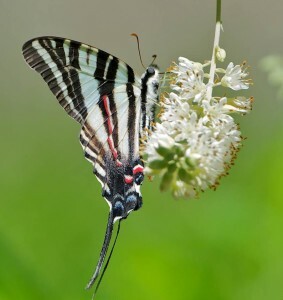 There’s also the NWF’s (National Wildlife Federation) Native Plant Finder program based on Doug Tallamy‘s research on which trees host which caterpillars. Here you also put in your zip code and it brings up appropriate native plants and butterflies and creates a list for you. Another program is TNC’s (The Nature Conservancy) Grow Wild. Here you pick a region and a series of icons pop up to help you describe your site which then produces suggested plants. Or, you can simply scroll further down the page and select plants based on your plant hardiness zone. There are also many localized plant search resources. For example, the Missouri Botanical Garden has a program called Plant Finder. Although this listing includes non-natives, you can select for only Missouri natives by soil type, amount of light, height of plants, etc. 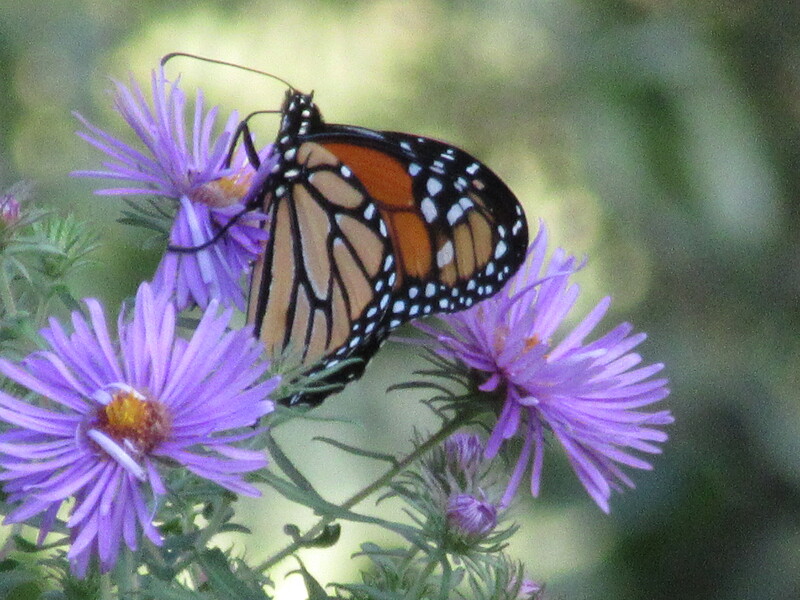 New England Aster (Symphotrichum novae-angliae) is a favorite fall forb used by many pollinators including monarch butterflies. The Morton Arboretum has an extensive Search Trees and Plants program for both natives and non-natives broken down by a variety of site information including the hardiness zones. It also allows you to select for landscape use and season of interest as well as growth rate. Don’t forget to select the native locale. 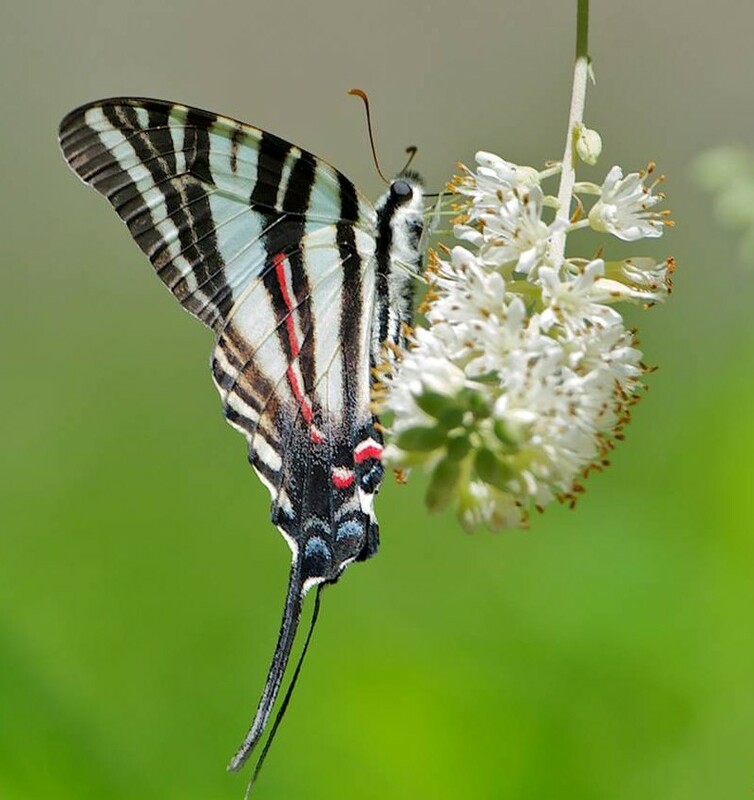 And the Grow Native website from the Missouri Prairie Foundation that includes a Native Plants Database for wildlife besides all the typical site selection criteria. Turk’s Cap Lily (Lilium superbum) grows in wet to well-drained soil in full sun to part shade. 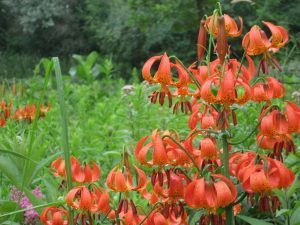 Their Turk’s cap-like blooms have orange flowers with a green star in their center and are densely spotted with maroon. A gorgeous addition to any rain garden. There are also sites devoted to plant selection for specialized gardens such as raingardens from the Central Ohio Rain Garden Initiative‘s Quick Guide to Native Plants for Rain Gardens. Or pollinators from the Xerces Society for Invertebrate Conservation. See their Pollinator-Friendly Plant Lists. And for monarch butterflies such as the listing of Milkweed Species Beneficial to the Monarch Butterfly developed by the United States Department of Agriculture Forest Service. If you are using other plant selection programs to help you design your gardens and natural landscapes, don’t hesitate to let me know by adding a comment to this post or by sending me an e-mail.